Aam Ka Panna, a refreshing drink with raw mangoes, I had tasted this only a couple of times but never tried making it at home. Last week, I wanted to try this and while browsing, I found that there are two ways of making it, either pressure cooking the mango or grilling the mango on direct flame, then peeling and removing the pulp. I was not sure how the smoky flavor from grilling would taste in a drink, so went ahead with the pressure cooker method, next time, of course, I am going to try the other method too. 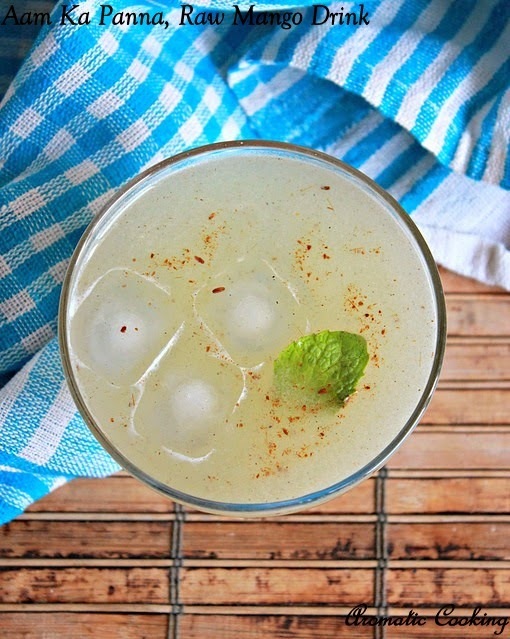 It's a very easy and tasty drink and is an excellent cooler, with a nice flavor from the roasted cumin and mint, a perfect drink for the hot summer..
Pressure cook the mango with some water for 2 or 3 whistles, when I opened the pressure pan, the skin had split and was easy to peel out. Cool, peel, remove the pulp and grind it to a smooth paste. To serve, take a tablespoon of the mango pulp, add a cup of water, mix in the pepper powder, black salt and sugar. 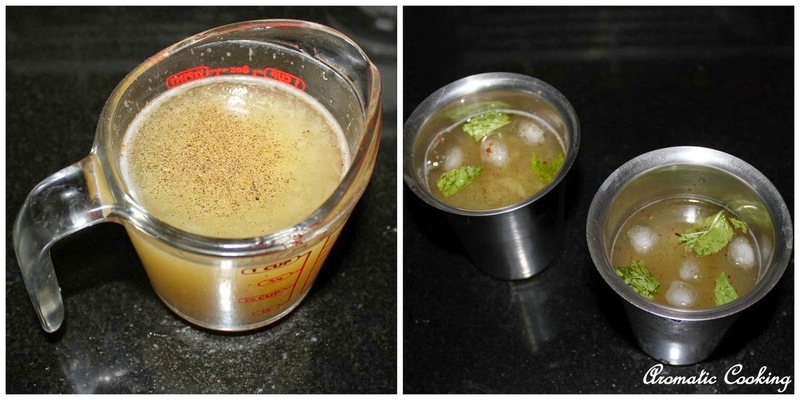 Add some ice cubes, sprinkle the cumin powder, add a mint leaf and serve it. You can cook the mango in a regular pan with lots of water, till the skin splits or becomes soft, so that you can just peel it away easily. The above measurements for the cumin, pepper, black salt are given for 1 cup, using a tablespoon of the pulp, again you may want to have a little more or less sugar and salt, depending on the sourness of the mango, the final drink should have a sweet, salty and tangy taste. refreshing drink for this summer ! Oh they look refreshing for this summer .So yummy . Looks so cool n refreshing! 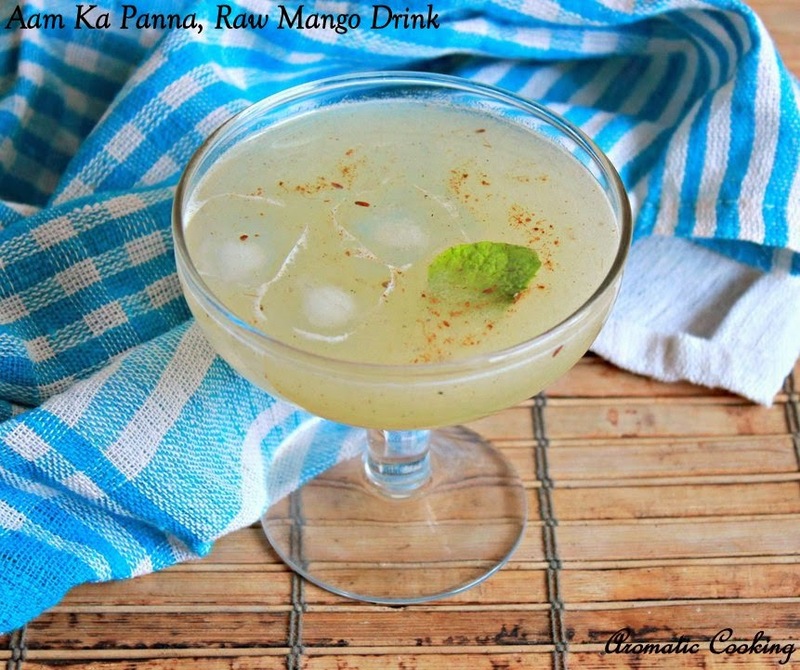 Perfect drink for the summer..
aam pana looks delicious love it. very refreshing drink!! perfect for the summer!! delicious refreshing drink.. Love it..
refreshing drink for the summer.. Refreshing and tasty panna.. perfect for this hot summer. Very refreshing drink with loads of flavours..